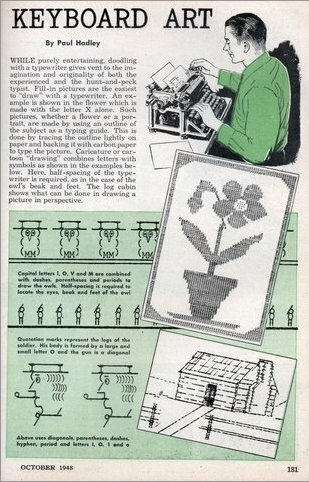 The Modern Merchanix Blog published in March, April and July 2006 three remarkable examples of nineteen thritees and fourties typewriter art, also known as keyboard art. The artwork was found in various preserved issues of the magazine “Popular Science” from 1939 and 1948. The Popular Science Magazine is still publishing today. They also have a website with a lot of (current ;)) content online. Visit the Popular Science Magazine Website. The art was created by the artists on classic mechanical typewriter machines. “Personal” Computers did not exist at that time yet, the term computer was not coined yet either and the ASCII standard was still 20-30 years away in the future. The following example is from 1939. One year earlier in 1938 did Germany?? ?s Konrad Zuse finish the Z1, one of the first binary digital computers and a machine that could be controlled through a punch tape. The project started in 1936 and the Z1 is considered by many the “first computer” and Konrad Zuse the “Inventor of the modern Computer”. 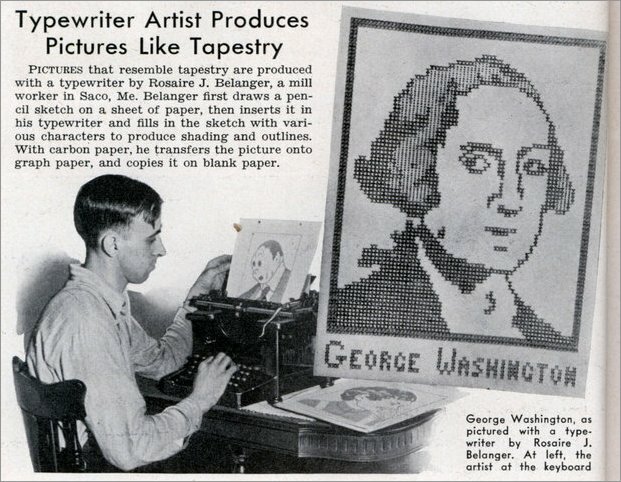 Pictures that resemble tapestry are produced with a typewriter by Rosaire J. Belanger, a mill worker in Saco, Me. Belanger first draws a pencil sketch on a sheet of paper, then inserts it in his typewriter and fills in the sketch with various characters to produce shading and outlines. With carbon paper, he transfers the picture onto graph paper, and copies it on blank paper. George Washington, as pictured with a type-writer by Rosaire J. Belanger. At the left, the artist at the keyboard. The following two examples are from 1948. 1948 is the same year when IBM built the SSEC (Selective Sequence Electronic Calculator). The IBM computer behemoth contained 12,000 tubes. Anyone can draw an accurate picture of the American flag on a typewriter, according to Menno Fast, a relief worker in Poland. Fast read a recent Popular Mechanics article on drawing pictures with a typewriter. 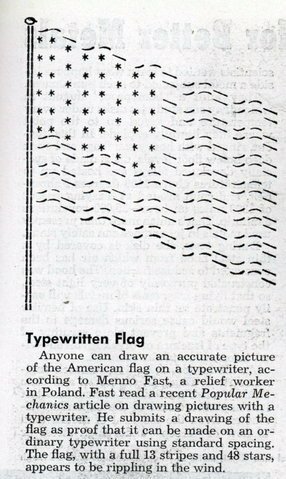 He submits a drawing of the flag as proof that it can be made on an ordinary typewriter using standard spacing. The flag, with a full 13 stripes and 48 stars, appears to be rippling in the wind. WHILE purely entertaining, doodling with a typewriter gives vent to the imagination and originality of both the experienced and the hunt-and-peck typist. Fill-in pictures are the easiest to ???draw??? with a typewriter. An example is shown in the flower which is made with the letter X alone. Such pictures, whether a flower or a portrait, are made by using an outline of the subject as a typing guide. This is done by tracing the outline lightly on paper and backing it with carbon paper to type the picture. Caricature or cartoon ???drawing??? combines letters with symbols as shown in the examples below. Here, half-spacing of the typewriter is required, as in the case of the owl?? ?s beak and feet. The log cabin shows what can be done in drawing a picture in perspective. The History of Computers – A Computer History Timeline at About.com. COMPUTER HISTORY – History from B.C. to today by Computer Hope. I hope you enjoyed the little trip back in time. Cool post as for me. It would be great to read more about that matter. The only thing it would also be great to see on this blog is a few pics of any gizmos. Next Post: How Could I Miss This?